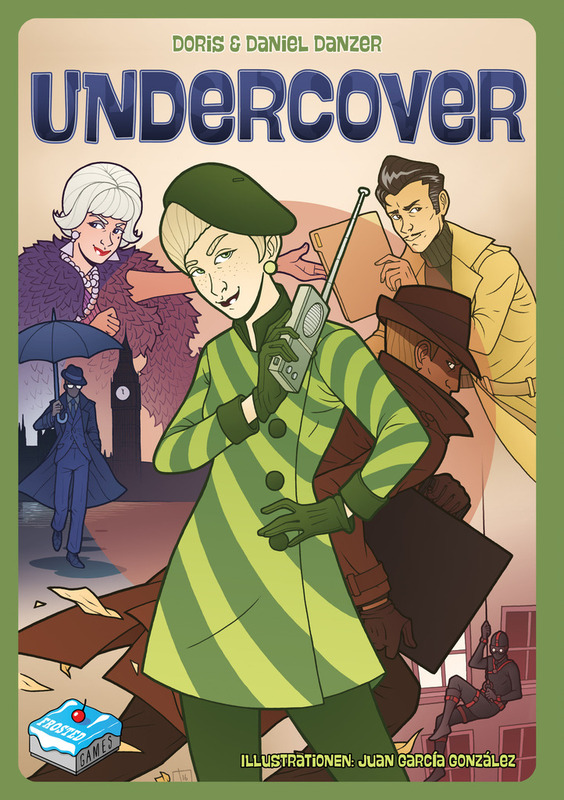 The goal of Undercover is to get most points. You get points by picking up point markers on one of 6 different scoring tracks. The order of the scoring markers is random and have a value between 3 and 8. Once you have picked up a tile on one track you can’t pick up any more on that track. That means that being able to get the highest numbered tile as possible on each track it how you win the game. The way you moving on the scoring tracks is by placing or moving tiles. The tiles are all double-sided. With one side being the agent side and the other being the undercover side. The tiles have the same 6 colours as the point tracks. On the point track all the coloured tracks run parallel. When you place a tile you can only place it next to tiles that have either the same colour as the tile you are placing or a tile with a colour that is next to the colour of the tile you are placing on the scoring tracks. Once you have placed a tile in this fashion you will count the number of spaces you may move. For each tile you are touching you will get one movement on the track that corresponds with the colour you are touching. You will also get a point of movement on the colour of the tile you placed. However, if you flipped the tile during our turn, the tile you place is worth two movement points. The trick is that you don’t know what the colour of the other side is. Or rather you don’t know for certain. The colour on the other side of the tile is limited to the colours next to the tile’s colour on the scoring track. So there are two options and only one tile available with either. So there is a way to deduct or remember what is on the other side of the tiles before you flip it but sometimes it is mostly a gamble, will you find the tile that lets you pick up a value 8 scoring token or one that only nets you 4? At the beginning of the game this is especially difficult because not all the tiles have been placed yet. But once all tiles have been placed you can deduct. A lot of the fun moments in the games come from when you fail to remember or deduce what is the colour on the other side of the tile you just flipped. The other really fun thing is when you manage to block an opponent’s options because you realised what they were trying to do in their next turn and your counter move fit well with your interests. This game has a lot cool things going for it. It is interactive and fun. 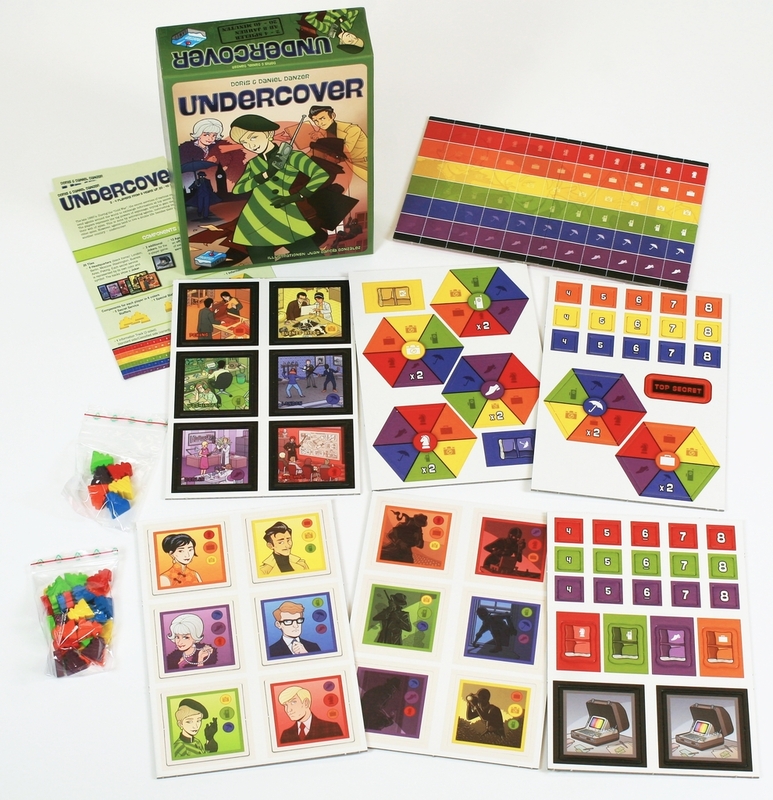 It uses what little theme there can be in such an abstract game in a fun way, and it has really awesome artwork that looks quite a bit like the Archer cartoon. On the downside, the game can be quite thinky. So for some people this will result in very long turns. For me it works well though and while it is not the best game ever it really brings a novel twist to a memory and deduction game with some quite deep tactics and strategy. If you are looking for a light abstract-ish game that plays well with 2-4 players, this is definitely one you should take a look at. The game has a simple set of rules that can be learned with no preparation in advanced. They are well written and clearly laid out. There is definitely both strategy and tactics in the game and it requires both if you want to win. A perfectly fine entry-level game.